The village of Kafr Sabt was located 10.5km from the city of Tiberias, on a gradually sloping plain in the eastern lower Galilee. To the north, it overlooked a wadi. It was linked to the village Kafr Kama by a secondary road and from there to the Tiberias-Nazareth highway. In the Roman period, the village was called Kefar Shabtay and was mentioned by the Arab geographer, al-Magdisi as one of the villages of Qisarya. He described the village as large and populated, with a mosque on the main street. The village was known as Cafarsset by the Crusaders. In 1944-45, the village consisted of 480 Muslim inhabitants and paid taxes on their wheat, barley, cotton, beehives and goats. Its houses were built of stone and surrounded by level and arable land. The villagers relied on their agriculture and livestock for their living. Their main crop was fruits and grain and in 1944-45, 4,358 dunums were used for planted cereals and 7 either for their orchards or irrigation. The layout went from east to the west and was long and narrow. There were several khirbas in the vicinity, including Khirbat Umm al-’Alaq, which was an extension of the village and contained ruins of houses, a fortress, a mosque, cisterns, presses and pieces of columns. 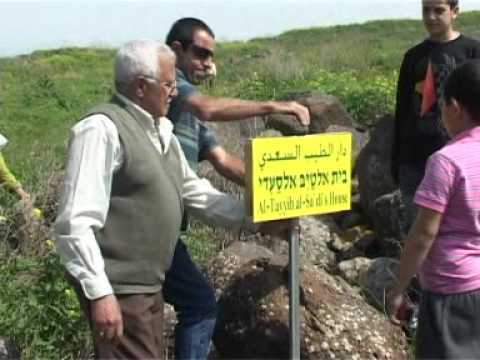 According to Israeli sources, the villagers fled on the 22nd of April, 1948 as a result of the occupation of the city of Tiberias on the 18th of April. In 1949, the lands were subject to a dispute between two adjacent Israeli settlements in the region, Sharona and Ilaniyya. Sharona had demanded compensation for the Arab attacks in the early months of the war and had been given 350 dunums of the lands of Kabr Sabt. But the farmers of the lands also had designs on the land and took it over by force, which resulted in an intervention from the Agriculture Ministry who ordered the settlers off the land. The Israeli settlement of Sde Ila is to the west of the village and was established in 1949 - however it is not located on the village land. Today, there are pile of stone and stone terraces as the only evidence that there once stood a village on the site. The lands around the village site are planted in grain, fruit trees and almond trees. Zochrot tour to Kafr Sabt with refugees of the village, 19 March 2011.